The DoubleTree hotel where the Winter SWL Fest is held. Last week, I attended the 31st annual Winter SWL Fest in Plymouth Meeting, Pennsylvania. This was the ninth year in a row I made the pilgrimage to join my radio friends and family–it was certainly a ‘Fest to be remembered! I made the trip by car, leaving Monday, February 26 and spent two nights in the DC area so that I could visit friends. On Tuesday, I met with my buddy (and SWLing Post contributor) Dan Robinson and we headed over to the National Capital Radio and Television Museum in Bowie, MD. NCRTV’s Brian Belanger gave us an excellent private tour of the museum, allowing me an opportunity to snap even more photos of this beautiful museum (you might recall the photo tour I posted in 2015). I will plan to post the new photos soon. Dan Robinson (left) and Brian Belanger (right) checking out a number of early 1900s receivers. Wednesday morning, I picked up my friend Mark Fahey (also an SWLing Post contributor) at a Metro stop in Maryland. Mark had just flown into DC from Sydney, Australia, the previous day. Knowing Mark is a huge fan of all things aviation, we made our way to the Steven F. Udvar-Hazy Center at Dulles Airport. This was my fourth visit to the museum, but Mark’s first. He had a blast and, like me, is sure to return in the future! A small selection of aircraft at the Udvar Hazy Center. View of the new Dulles Airport from the former ATC tower at the Udvar Hazy Center. We left the museum by 2:00, to avoid serious DC traffic, and arrived in Plymouth Meeting, PA by dinner time. Like last year, the Winter SWL Fest took place over a Thursday, Friday and Saturday. The schedule was jam-packed and covered the full spectrum of radio. Our own “fiestero” reflects on his trips to Spain, Portugal and Gibraltar experiencing the complicated radio scene there. From longwave to DAB, community radio to big national networks–even foreign language FM stations–it’s true that the Spanish dial remains impressive. Included are slides from his tour and interview at Madrid’s Radio Exterior de España highlighting their amazing audio vault. He’ll also reflect on DX climbs at the Rock of Gibraltar (UK) and Veleta, the third highest peak in Spain (11,142’). Bring your own sangría. You CAN decode FM IBOC, thanks to a researcher who figured out the protocol. We’ll hear how that works, along with a look at how to decode amateur APRS packet and display weather alerts on a map, and how to decode NextGen ATC on the cheap, without having to feed data to Flight Aware. We’ll also give you some ideas on how to make use of a Raspberry Pi with the RTL stick, providing yet another source of cheap radio fun. TV DXing via sporadic e-skip and tropospheric propagation, from an historical perspective in the 50s-80s when there were many analog DX targets available in North Americ, to today’s low VHF (Channels 2-6) scenario. Few US stations are using those channels now making DOUBLE-hop e-skip reception possible, something very few experienced before 2009 but a number of us in the northeast US and Canada have observed quite a few times now. Instead of new states and provinces, we’re logging new countries! Includes video clips of single hop vs. double hop and equipment and technique tips. This popular series resumes with Jef covering terminated loop theory and construction, along with some new (and old) toys for show and tell. Time permitting, he will start on loop phasing techniques. How well do you know radio? AM, shortwave, utilities, transmitter sites, station names, call letters, frequencies, interval signals, radio personalities, program names, and more, we’ll have questions from all categories. In the end we will crown the first Winterfest Trivia King (or Queen!). The quiz is open to anyone with the courage to participate. We will examine the impact of “smart speakers” on the listening experience. What can you do and what can’t you do with these systems? The internet radio and international radio still live but they live inside the speaker. Bring your own personal experience and questions to share. Included will be the presenter’s personal use and testing of systems such as Amazon Alexa and Sonos and compare the cost and benefits to using these as alternative listening sources as well as their limitations. Back to Basics – Programming Strategies for the new generation scanners. Have the newer generation scanners got you stumped? This year we’re going back to basics, and will discuss programming strategies, tweaks and tips for the newer digital-capable scanners. We’ll also give a few nods to some of the software packages out there that can make this task easier. A review of Pirate Radio news during the past year and the announcement of the new class of inductees to the North American Pirate Radio Hall of Fame. Time permitting, a discussion of the NASWA Pirate Radio Report column also is planned. We will take a look at both shortwave radio audio archives, what has been done since our 2010 Winter SWL Fest forum, and what collections have been preserved. We will also dive into the concept of radio spectrum archiving, noting the challenges and amazing benefits to future historians, media specialists, anthropologists and—yes–radio enthusiasts too. Imagine a digital library full of recordings you could load on a web-based application and tune through as if it were live radio–a time traveling WebSDR! We’ll live demo spectrum recordings dating back to 1986. An experimental documentary film by Amanda Dawn Christie about the RCI shortwave radio towers in Sackville, New Brunswick, Canada. Images captured on film are accompanied by personal stories told by people who lived near the towers. For over 67 years, the Radio Canada International (RCI) shortwave site broadcast all over the world. In 2012, budget cuts necessitated the decommissioning of this site. This session presents four appetizer sized topics (each which could easily have consumed a full hour of discussion) in convenient, portion controlled sizes. Transformation of Marginal & Noisy Tropical-Band Stations into Armchair Quality Reception: A live demonstration of real-time digital enhancement and filtering of shortwave signals. Interval Signals from the Jungles and Volcanoes: For over 40 years I have been recording Indonesian interval signals and now the collection is complete. These are not noisy, low-fi recordings; every one is a pristine, studio-quality recording that reflects the exotic location and unique culture of each station. What’s Happening in The Studio: Thousands of radio stations now continuously stream high-definition video of their studios in simulcast to their audio broadcast. We will drop in and discover what is happening behind the microphones. Radio Soundscapes: Let’s explore the growing selection of what hipsters and eclectic music collectors are listening to. David Goren and friends celebrate the short wavelengths in story, song, and vintage sounds. Saul Broudy, our resident folk song laureate presents an extended set of radio favorites and more. Interdisciplinary artist Amanda Dawn Christie performs using her theremin to trigger sounds and images of the towers at RCI Sackville. Later in the evening, we’ll feature a specially upconverted segment on FM Urban Pirate Radio including the debut of the Brooklyn Pirate Radio Sound Map. Most modern satellites are on SHF frequencies, are used for high-bandwidth, global communication, and require special antennas and equipment to receive and track. But there are also constellations of satellites operating on VHF and UHF frequencies, easily received with standard communications receivers and antennas, and what you can hear on them can be very surprising. Originally intended for tactical military use, these birds are largely dominated by pirates, unintended signals, and the occasional legitimate user. For many of us Shortwave DXing has become more a reminiscing than a listening exercise. Oh, if we could only reprise the ubiquitous Indonesians, Venezuelans, Ecuadorians, Brazilians and Indian regionals! Into this seeming abyss comes the world of remote receivers such as the Perseus, Global Tuner and KiwiSDR networks. In this session we’ll educate, discuss and debate the merits of traveling to virtual DXpeditions through the use of remote receivers around the globe. Take a behind-the-scenes look at network news RF/field operations covering some of the largest stories that have made world headlines in recent memory, as well as a discussion regarding the technological changes that have changed the definition of what real-news is, and is not. Introducing VOR’s 2018 North American Short Wave Television Service including a virtually live, slow scan slideshow broadcast direct from Rfchokia – the apocryphal breakaway republic formerly known as South Pottsylvania. This very special event will be emceed and produced by VOR spokesman/ cartoonist Jeff K1NSS/WPE2GEP, eager to wish Best DX to you and your family. 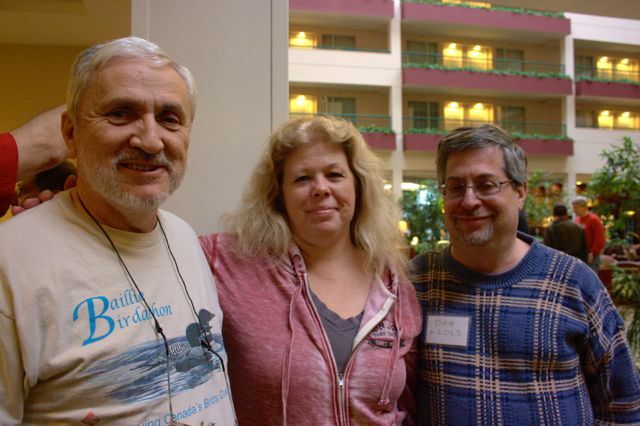 Dan and Skip chronicle the personal memories of Fest attendees about what shortwave has meant to them throughout their lives, putting some needed focus on the human side, rather than the more commonly heard mechanical or technical aspects, of the hobby. Each year at the Winter SWL Fest, we hold a silent auction with a wide array of donated goods. I donated a box full of gear myself. All of the proceeds are given to charities–Ears To Our World has been a proud recipient of portions of the Silent Auction proceeds since I first attended in 2009! Of course, what everyone at the 2018 Winter SWL Fest will remember is that Friday morning, we were hit by a “nor’easter”–a storm with strong winds, and driving rain that by noon had turned to snow. Traffic outside the hotel was an absolute mess–and quite treacherous. It was a little crazy. Right around 2:30–only a minute after my presentation ended, the mains/grid power flickered out. The hotel staff kept everyone informed with news posts like this one. Fortunately, the hotel’s backup generator did power one set of outlets in the conference room which fed the projector and amplified speakers, so the show continued…albeit in the dark! Of course, there are advantages to being in a hotel with little power and much less RF noise–I was able to do some satisfactory MW DXing from my room window. A rare opportunity! We held the Saturday night banquet in the hotel’s atrium area which was was better lit that the interior conference rooms. It was a very memorable banquet. All-in-all, the Fest was a massive success. I heard very few complaints about the power outage, only praise for the forums, our guest speaker (Amanda Dawn Christie) and all of those who make the Fest a reality–especially John Figliozzi and Richard Cuff. If you couldn’t make the Fest this year due to your schedule (or the weather! ), please come next year. I promise, you won’t regret it! Dates for the 2019 Fest have already been posted! Festmeisters Ruch Cuff and John Figliozzi prepare banquet material with flashlights. Once again, many thanks to Richard Cuff and John Figliozzi for all of the hard work they put into organizing the Winter SWL Fest! You pulled off another great one! This entry was posted in News and tagged 2018 Winter SWL Fest, Dan Robinson, Mark Fahey, Plymouth Meeting PA, shortwave, Shortwave Radio Conventions, SWL Fest, Winter SWL Fest on March 7, 2018 by Thomas.